This unique design utilizes a continuous Nylon core and heavy padding. 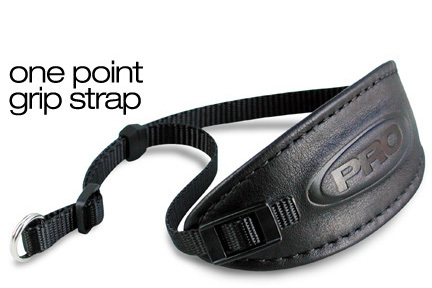 Ideal for all very heavy cameras or camcorders that can accept a 3/8 inch strap. photographer to adjust the length of the belt and pull the camera close to the palm. Now available in fifteen beautiful leather colors and a Deluxe version (see below). available for cameras with small eyelets, such as Leica, Canon, etc. substituting metal buckles (nickel or brass) and genuine leather belts. Available in all fifteen of our beautiful ProStrap leather colors.